To read about Einstein's motivation for the general theory of relativity and his struggle to formulate it, read the first part of this article. Einstein's theory changed our understanding of space and time. Before Einstein people thought of space as stage on which the laws of physics play out. We could throw in some stars or some planets and they would move around on this stage. Gravity is the manifestation of the curvature of space and time. Image courtesy NASA. Einstein realised that space isn't as passive as that. It is dynamic and it responds to what's happening within it. If you put something heavy in space — let's say a planet like Earth — then space around it gives a little. The presence of the planet causes a small dent in space (and in fact, in time as well). When something else moves close to the planet — say the Moon — it feels this dent in space and rolls around the planet like a marble rolling in a bowl. This is what we call gravity. This may sound like something you'd see in Star Trek, but it's not. It's the way our Universe works. This dance of the cosmos, as galaxies orbit and spiral, is a dance between matter and spacetime itself. Stars and planets move, causing space to bend in their wake, causing other stars and planets to move, causing space to bend in their wake. And so on. This is Einstein's great insight. Gravity is the manifestation of the curvature of space and time. How do we know it's right? Gravity bending light around a massive object. Image: DLR, GFDL. How do we know that general relativity is really true? Einstein's new theory made a number of important predictions that Newton's theory didn't. One of them is that light bends. Suppose there's a star hidden behind the Sun. You might think that the light from the star can't get to us because the Sun is in the way, but Einstein realised that this wasn't the case. According to his theory, because there's an indentation in space, light doesn't have to travel in a straight line. It can head out at some angle, bend around the Sun, and then come to hit our eyes. When we trace the light ray back in a straight line, we see the star sitting a little to the left or right of the Sun, rather than behind it. So we think that the position of the star is a little different from its actual position. You can see the Sun in the middle, blackened out by the Moon. And the stars around. When they measured the position of the stars they found that they had shifted by exactly the amount predicted by Einstein. 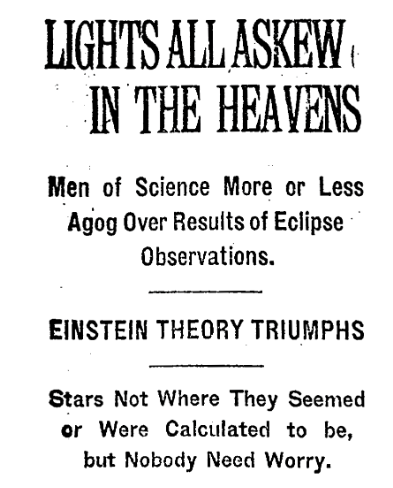 The eclipse measurements propelled Einstein to superstardom. In part it was because the first world war had just finished and here was a great story about an English astronomer confirming a German scientist's theory. The story was big news. It made the front page of the New York Times every day for a week. Anyone remotely famous, from politicians to actors, were being asked whether they understood the theory of relativity. All of them said they had no idea what it was but they were sure it was important. A page from the New York Times. For the most part, Einstein loved all this publicity. He was great with pithy little quotes to the press. He had his iconic look. They loved him. But fame had its downside. Einstein lived in Berlin and he was Jewish. Being a prominent public Jewish intellectual in Berlin after the war was not the easiest position to be in. On some occasions there were concerns about Einstein's safety and the police advised him to leave town. There was also growing anti-Semitism within the scientific establishment in Germany, peddling the astonishing idea that Germans should focus on "Deutsche Physik" instead of Jewish physics, where Jewish physics meant relativity. There were conferences organised against relativity, really pure anti-Semitism wrapped up in scientific language to try to argue that the theory was controversial. And it had an effect. 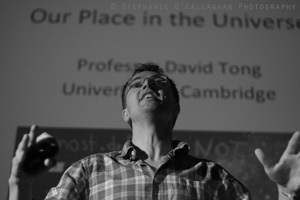 It's very easy for vocal people to shout loudly and muddy the scientific waters. This anti-Semitism even affected the Nobel prize. It was obvious that Einstein should win it, but there was at least one Nobel laureate on an anti-Semitic crusade. In 1921 it became clear that if the prize wasn't awarded to Einstein, it couldn't be awarded to anyone. Incredibly, the committee chose not to give it to anyone. In 1922 — presumably because the problem hadn't gone away — they saw reason and awarded a back-dated 1921 Nobel prize to Einstein. Even then, the committee didn't award it for general relativity, but for his other achievements. Einstein didn't turn up for the ceremony. A hundred years on, the image of Einstein the scientist, his famous equation and even the idea that "everything's relative" are firmly rooted in mainstream culture. In the world of science Einstein's legacy can't be overestimated. The whole ﬁeld of cosmology, the study of the Universe as a whole, is only possible because of the framework of general relativity. Soon after Einstein's theory we learned something extraordinary; one of the most important facts in science: the Universe hasn't always been the way it is. There was a time in the past — called the Big Bang — when the Universe was much smaller, when there were no stars or planets, instead it was filled with a hot dense fireball, out of which everything we see emerged. This time was 13.7 billion years ago. Cosmology wouldn't be possible without general relativity. This is a group of galaxies as seen by the Hubble Space Telescope. Image courtesy NASA, ESA, M. Livio and the Hubble Heritage Team (STScl/AURA). Perhaps the biggest mystery posed by Einstein's theory are black holes. They are regions of space where the bending gets so great that light itself gets trapped. They exist in our Universe. For example, we know that there is an enormous black hole at the centre of our galaxy. But they are objects that we really don't understand at all. In some sense, Stephen Hawking's great contribution to science was to convince us all that none of us understood black holes. He laid down a gauntlet to physicists to try to make sense of them, and no one has fully succeeded yet. Black holes remain one of the biggest open problems in theoretical physics. General relativity has passed every test it has been set so far, but there is one prediction we still haven't got any direct evidence for. It's something called gravity waves. If you drop a stone on the surface of a pond you will create waves in the water. Similarly, if you do anything dramatic in space and time, there should be ripples of space which move away. Such dramatic events are happening all the time: there are stars exploding in our galaxy, there are black holes colliding, and there are massive neutron stars colliding. Each of these should produce gravitational waves that we can hope to detect. If gravity waves from black holes or exploding stars were to pass through the Earth, the entire Earth would just shrink a little bit and then breathe out again. There are a number of experiments around the world designed to measure this effect. The best that we have presently have are in the US and go by the name of LIGO. There are two of them, one in the state of Louisiana, and one in the state of Washington. They're astonishing: two buildings at right angles, each about 2.5 miles long. In these buildings they fire laser beams backwards and forwards, constantly measuring the size of the building to an accuracy which is much less than the size of an atom. Over the next few years, we expect that these experiments, or others, will finally succeed in seeing gravitational waves. This will be one more great triumph of Einstein's theory. "In the world of science Einstein's legacy can't be underestimated." Did you mean to say 'overestimated'? Of course, it can, ignorantly, be under- OR overestimated, but surely you meant the latter? Yes we did! Thanks for pointing that out, we've corrected it. 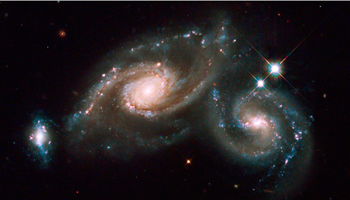 When viewing distant stars and galaxies, how do we decide the actual 'position' of that body versus where it appears? 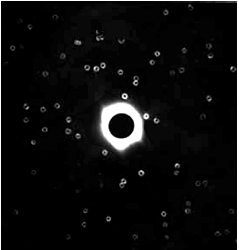 For example, the light from a star on its way to our eye, passes close to two or a dozen other massive bodies, bending a little with each passing and therefore changing perceived position of the light's origin. In fact some of the light starts out pointed away from our line of sight, but during its journey is bent just enough to finally end up in our telescope. Could there not be several different 'beams' of light from the same star which when they finally get to us, appear to have originated from several different stars, based on their incoming trajectories? And if this is possible, how do we 'count the stars' or galaxies accurately if two or more apparent bodies are in fact from just one origin? 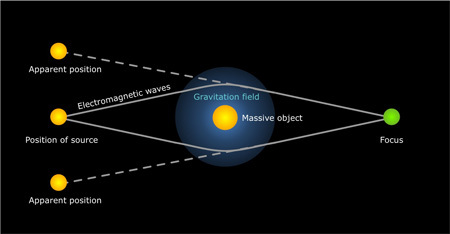 And the gravitational waves have been proved!